Our Pivoting Solar Davit Mount kit allows you to mount your solar package to virtually any set of davits. With newly re-designed clamp-on or bolt-on options you can now securely mount and pivot your solar panel. Our Pivoting Mount allows you to install your solar panel on any set of boat davits. The Pivoting Solar Davit Mount uses a premium 6' stainless steel support tube which can be mounted with your choice of hardware (Clamp-on / Bolt-on) depending on your davit design. The included 26" 2-Bar Rail-Mount Clamp Kit, securely attaches your solar panel to the support tube. Once installed the rail mount clamps provide simple tool free pivoting adjustment of your panel to track the sun or simply rotate out of the way. This design also makes end of the season storage and removal a snap. The clamp-on kit is available for 1" or 1-1/4" davit arms only, please make sure to select the correct kit based on your davit arm dimensions. Bolt-on kits are available for a more permanent installation or if your davit arms are larger than 1-1/4". Bolt on options are available for both tubular or square shaped arms. Our stock kits include a 6" stainless steel support bar, which is designed to be trimmed to fit. If your span between davit arms is greater than 6' we offer and 8' option. The pivoting davit mount is only designed to support a single solar panel in the orientation shown. When upgrading to the 8' Support bar we also recommend the RMC-XHD to provide the most stable platform. For larger solar panels greater the 100-watts, we recommend the XHD kit which provides (3) panel mounts and clamps. This kit provides greater stability for larger heavier panels and will also help to stiffen your support bar and davits. Our Rail Mount Clamp kits are designed to support panels up to 26-5/16" in width. *If you have any questions or need a custom mount or substitution please give us a call. Your Solar panel must fit between your davit arms in order to pivot. To avoid damage, solar panels can only be mounted in the orientation shown. For solar panels greater than 140-watts we recommend one of our Fixed Davit Mounts. 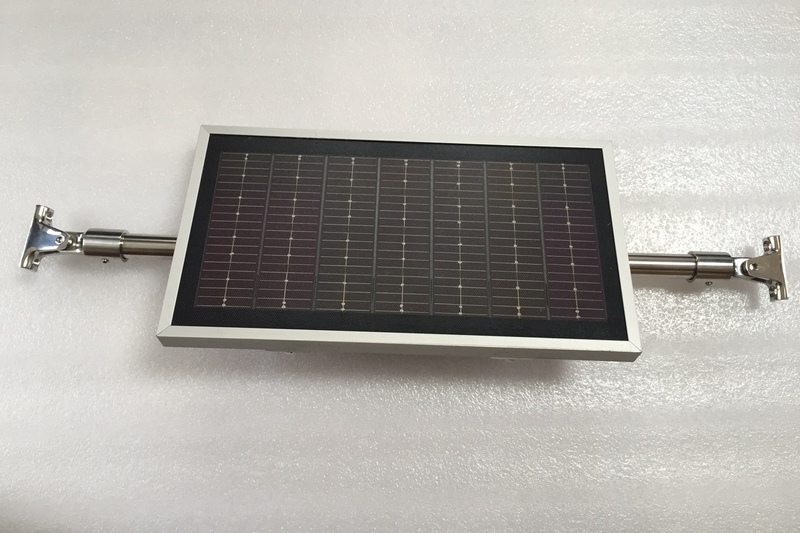 The aluminum framed corners of most solar panels are generally, quite sharp and potentially very dangerous. Protect your equipment, lines, and especially yourself with these specially designed solar panel corner protectors. Universal size. Trim-to-fit. Sold as a set of 4. Attaches easily using double sided tape or for more permanent bonds use 5200 adhesive.